There were ecstatic scenes at the final whistle as Team Marshalls thumped All Nations University College 35-10 at the Robert Mensah Stadium in Cape Coast to emerge champions for the second consecutive year at the Private University Sports Association of Ghana [PUSAG] Games 2017. That victory cemented Marshalls’ place in the history books as the first institution to win gold in its first two appearances at the Games. 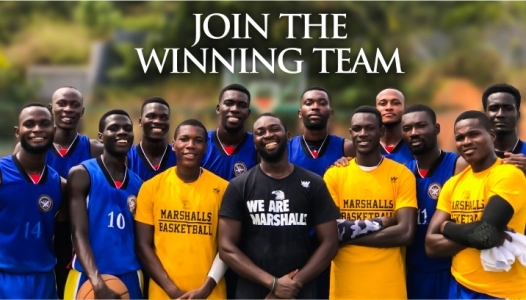 Marshalls entered this year’s competition as the team to beat following a resounding performance when the team debuted at the games last year at the El Wak stadium. That performance climaxed with the ultimate trophy and began a surreal journey of several amazing feats that ensured that Marshalls will soon become a household name in College sports, and a powerhouse in college basketball. 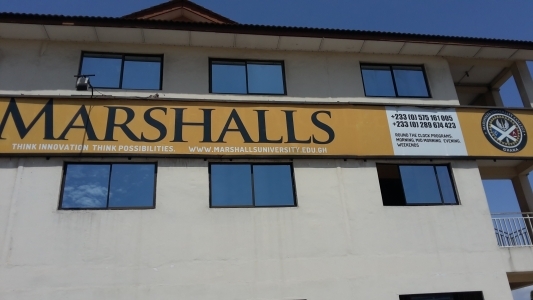 As defending champions, Marshalls were seeded in Group A along with Zenith University College, Central University College and the Garden City University College. Playing in their traditional blue and yellow jersey, Marshalls whitewashed all their opponents at the group stages before confronting Pentecost University College at the Quarter Final stage. The Marshalls made their intentions clear immediately from jam-ball, pinning Pentecost University backs to the wall. It was a carefully planned strategy adopted by the champions in a bid to neutralize their opponents’ strengths. Pentecost had bullied every opponent at the group stage with their physicality and power but over here they struggled as their opponents kept moving the ball around with pace and precision, as well as closing down with aggression. They seemed overwhelmed as Marshalls were first to every loose ball and opted for layups to draw fouls and avoid the physical duels at the rebound. Marshalls went in at the first break with a game-high 17 point lead. Even though the Pentecostals recouped towards the final quarter, they could only salvage some pride. Marshalls had beaten them fairly and squarely and their attempts proved too little too late as Marshalls went on to win 35-27. 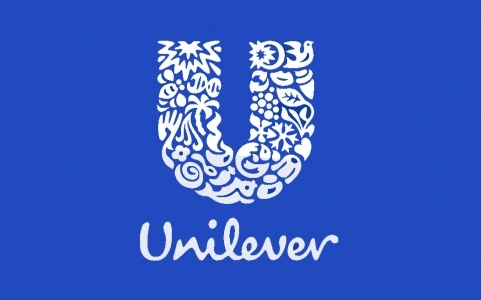 Another religious-oriented opponent was next against Marshalls at the Semi Final stage in the form of Islamic University. A frenzied, hostile atmosphere was being built at this point against Team Marshalls. It seemed as though the whole courtside were against Marshalls’ progress to the finals. It was understandable as Marshalls urged closer to a historic feat of never having lost a basketball game at the PUSAG Games for two consecutive years. James Okine, coach of Marshalls, paraded a strong starting five of Boubaccar Gillen, Bejamin Debrah, Emmanuel Sarkoh, David Asingar and David Laryea. His team however made a slow start to the game as Islamic University capitalized on the hostility of the crowd against their opponents. Islamic University played some beautiful combinations in the opening quarter while Marshalls seemed jittery, making lots of turnovers in the process. Marshalls regained their composure in the second quarter but kept being frustrated by some rough play by their opponents. Dangerman David Asingar was the victim of most of the rough play. By the end of the second quarter, Asingar was both the top scoring player of the half and the most bloodied after he took at least three whacks in the face and bled profusely in the mouth. Coach Okine responded to the challenge by introducing skipper Anthony Adade and Emmanuel Evans-Anfom for Boubaccar Gillen and David Laryea. Nigerian David Asingar stayed on. The change proved inspired as Marshalls immediately turned the game around, taking a four point lead for the first time in the game. It was the two substitutes who combined as Evans-Anfom made a good block in his own area before sending Adade through with a raking pass. The intelligent Power Forward slowed down the play before sending another diagonal pass to Sarkoh who let fly from the left side of the three-pointer line in the move of the game by far. It was the tonic that Marshalls needed to kick their tournament back to life. Islamic University kept chasing shadows from that moment on as Marshalls resorted to overcrowding their opponents in tight spaces and forcing turnovers. Marshalls’ opponents were found wanting for a plan B as they were swept away with ferocious fast breaks. At the end, Islamic University joined Marshalls’ list of casualties, losing 30-18 points in the process. Marshalls then went on to make a successful defense of their title as they walloped All Nations University College 35-10 in the final. In what was a one-sided contest, Team Marshalls led 16-0 at the end of the quarter, not giving their opponents a dog sniff. It took till the second quarter for All Nations to record a point, drawing two from the free-throw line. Marshalls played with holy anger as they forced the enemy against the ropes in a bid to silence the largely partisan spectators. 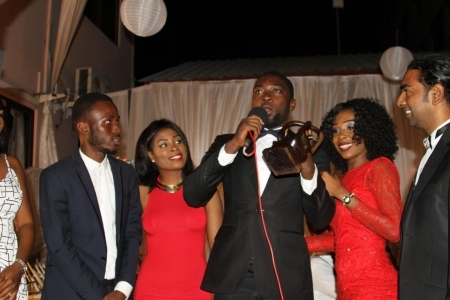 Emmanuel Sarkoh and Enoch Boadi, who had been introduced at this point, were the stars of the show. As they side-stepped the opponents to score spectacular points, the Marshalls bench kept chanting “Too easy”. Coach James Okine took advantage of the game complexion to give some much-sought playing time to some freshmen debutants as Marshalls went on to win the trophy at stake back-to-back. Finally, Marshalls had cemented its reputation as one of the leading basketball colleges in the country, and with the back-to-back successes at the PUSAG Games, Team Marshalls knew that no other team held the bragging rights as the Private University Basketball superpowers. After the team had been presented their trophy, the crowd watched in silent admiration as they defiantly broke out in the now-famous chant: Who are we? Marshalls. What do we do? We win.